A savory type of food that is baked similar to a pie or pastry but without a crust. Pies and quiche are often made without crusts that are formed to hold the contents within a food wrap. Instead, the ingredients for a crustless version are typically combined with eggs and cheese that serve as binders to keep all the contents firmly held together for serving. 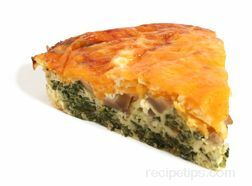 Crustless Quiche and pies are nutritional as well as easy to prepare foods.